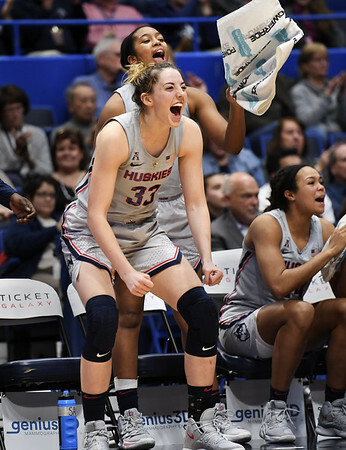 HARTFORD - All-American Katie Lou Samuelson broke out of her shooting slump, scoring a season-high 31 points to lead No. 5 UConn over East Carolina 118-55 on Wednesday night. Napheesa Collier hit all 10 of her shots and added 21 points for the Huskies (20-2, 9-0 American Athletic Conference), who reached 20 wins for the 26th straight season. Christyn Williams scored 15 points, Megan Walker 14, and Crystal Dangerfield had 12 points and 12 assists. Raven Johnson had 14 points and Lashonda Monk 12 for East Carolina (11-11, 2-7) which lost for the sixth time in seven games. UConn opened with a 16-4 run. It was 41-13 after 10 minutes and 70-25 at the half. Samuelson had 18 points in the first quarter and had 27 by halftime. UConn has fallen to its lowest national ranking in a dozen years after a loss to No. 3 Louisville and a lackluster 10-point win at Cincinnati. Samuelson was 7 of 24 from the floor in those two games. She made 9 of 11 shots on Wednesday and hit 11 of 13 foul shots. The Huskies have won 87 straight home games and remain undefeated in conference play (110-0) since the inception of the American Athletic Conference in 2013. This was their 95th straight regular-season conference win, and they have also won all five conference tournaments. East Carolina: The Pirates fall to 0-10 against UConn. ECU's last win over a ranked opponent came four years ago when the Pirates beat then No. 25 South Florida 65-64. UConn: The Huskies have scored at least 90 points in their last five meetings with ECU. They won the first nine games in the series by an average of just under 49 points per game. ECU: The Pirates return home to host Memphis on Saturday afternoon. UConn: The Huskies head back to campus for a game with Temple on Saturday before hosting No. 12 South Carolina on Monday back in Hartford. Posted in Newington Town Crier, UConn on Wednesday, 6 February 2019 21:49. Updated: Wednesday, 6 February 2019 21:52.